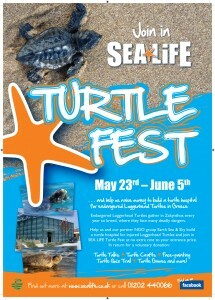 CuCo Creative has produced the official poster for Turtle Fest, an upcoming conservation campaign promoted by international theme park Sea Life. The fortnight-long festival will raise funds for a new turtle sanctuary in the Mediterranean – and CuCo’s poster will be displayed at all of Sea Life’s sites in the UK and across Europe. The project is CuCo’s latest involvement in the €350,000 Sea Life campaign to save the endangered loggerhead turtle by opening and maintaining a rescue centre on the Greek island of Zante. The festival will run from 23 May until 5 June and will embrace all things turtle, including talks, quizzes, games and crafts. “It’s a brilliant cause and, with the Weymouth Sea Life centre barely an hour from our Bournemouth offices, I’m hoping to take the family along to join in the fun,” says CuCo creative director Christian Cutler.